Cultural Evolution: For OneCoast, culture and core values are the foundation of the company’s success. “Culture trumps strategy. If you don’t have the culture to execute a good strategy, it won’t get executed well.” So says John Keiser, CEO of OneCoast, a national sales and marketing organization for a number of companies, including gift industry anchors Mud Pie, C.R. Gibson, Studio M and Demdaco, as well as League and Legacy in its Collegiate business. When Keiser, who started with OneCoast 14 years ago, became CEO in 2010, he wanted to make OneCoast more than a place to just receive a paycheck. Under his leadership, the management turned its attention to Core Values to create an environment that more resembles “family” than work. “I wanted people to connect with more than just their jobs,” he said. The core values were always there, he added, but they weren’t always the focus. “We wanted to create a quality experience for all our employees,” Majda Rensberger, executive vice president for OneCoast. Left, the entire OneCoast team gathers for a photo at the company's annual sales and training meeting in Atlanta. Above: CEO John Keiser and executive vice president Majda Rensberger. Covering everything from integrity to having fun, OneCoast’s core values have been designed to create a sense of ownership in the company and an opportunity for everyone to find a way to demonstrate leadership, Keiser said. Since they’ve become the focal point for the company, the core values have helped to teach, motivate and inspire those who work at the sales and marketing services organization. “The core values are our personality. They represent who we are. We are human so we are not perfect in following them, but they are our guide,” Keiser said. When the initiative got underway, there were six core values. Most recently, the organization added a seventh—Make a Difference—at its annual training and sales meeting this past December in Atlanta. “With 300 people in our organization, we can have an impact on our communities individually and collectively,” Rensberger noted. The meeting is about education, networking, recognition and enjoying time with peers. Each year, corporate excellence is rewarded too. The company hosts two award nights, one dedicated to its vendors’ recognition of sales performance and the second focusing on OneCoast’s recognition of its employees. From incoming territory managers to team leaders, employees are applauded for their efforts, performance, leading by example and willingness to work collaboratively. OneCoast employees are also rewarded every day with company transparency and the ability to voice opinions as long as it is done respectfully, said Rensberger. OneCoast regularly polls employees about how the company can serve its employees better. For example, the “Quiet Zone” discourages managers from initiating a conversation between the hours of 7:00 pm and 5:00 am (local time) or on weekends. While the management team will respond to employee or customer inquiries, the Quiet Zone was designed to respect the employees’ work/life balance, she added. The values are intended to define OneCoast’s relationship with its employees, but the initiative has transcended to the vendors the company represents and the retail customers it serves. That’s not by accident. OneCoast works hard to create displays that show retailers how to merchandise product. Once the show starts, at OneCoast, these aisles are filled with customers. 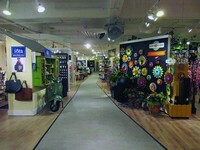 OneCoast showrooms all have entrance counters where employees can be paged and retailers can ask questions. In choosing companies to represent, OneCoast is diligent about finding vendors that are a cultural fit. “When discussing potential partnerships, we share our values with vendors. We look for vendors who are a cultural match for us,” Rensberger said. With the right vendor partners, OneCoast has the ability to go above and beyond “just selling to the retailer,” she continued. “We work to understand our partners’ strategies and help them develop successful sales and marketing initiatives. In addition, with different salespeople across four divisions—Demdaco, Mud Pie, the Gift Division and Collegiate & Custom division—some retailers could have multiple representatives. TMs are encouraged to collaborate for the retailer. By focusing on the core values, Keiser feels the initiative has made OneCoast a better place to work.